We've seen people across Africa do amazing things with the internet and technology—for themselves, their communities and the world. 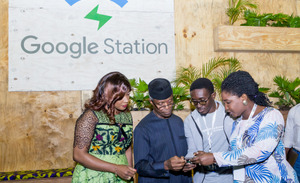 Over the past 10 years in which Google has had offices in Africa, we've been excited to be a part of that transformation. Ultimately 10 million Africans will benefit from our digital skills training program with 2 million people having already completed the course, and we’re supporting 100,000 developers and over 60 tech startups through our Launchpad Accelerator Africa. We’re also adapting our products to make it easy for people to discover the best of the internet, even on low-RAM smartphones or unstable network connections. In recent years we've also witnessed an increasing interest in machine learning research across the continent. Events like Data Science Africa 2017 in Tanzania, the 2017 Deep Learning Indaba event in South Africa, and follow-on IndabaX events in 2018 in multiple countries have shown an exciting and continuing growth of the computer science research community in Africa. We’re committed to collaborating with local universities and research centers, as well as working with policy makers on the potential uses of AI in Africa. On a personal note, both of the authors have ties to Africa—Jeff spent part of his childhood in Uganda and Somalia, and Moustapha grew up in Senegal. As such, we’re excited to combine our research interests in AI and machine learning and our experience in Africa to push the boundaries of AI while solving challenges in areas such as healthcare, agriculture, and education. AI has great potential to positively impact the world, and more so if the world is well represented in the development of new AI technologies. So it makes sense to us that the world should be well represented in the development of AI. Our new AI center in Accra joins the list of other locations around the world where we focus on AI. If you’re a machine learning researcher interested in joining this new center, you can apply as a Research Scientist or a Research Software Engineer. You can also view all our open opportunities on our site.